It is an amazingly funny book penned by this former radical, turned conservative. Want to know how to beat the lefties at their own game … read the book. And David Kahane is a guest on the show today. We’ll get to the bottom of this radical’s newest book. The book is written by a former disaffected Hollywood screen writer and is in fact, my friend and successful Hollywood screenwriter Michael Walsh. 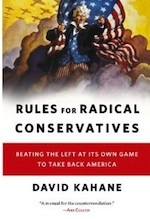 The book just out yesterday has already received rave reviews (well, except from the left) as he takes the reader through the mind of lefties, and how the righties can use the same strategies the left employs, to take back America. You can buy the book there or here at Amazon. And here’s a link to an interview at National Review conducted by National Review’s Katherine Jean Lopez. KATHRYN JEAN LOPEZ: I was around at David Kahane’s conception, and yet I don’t think I could answer this question: What was the moment where you knew you had to bring Kahane to life? MICHAEL WALSH: Oddly enough, “Dave” started life because I wanted to explain the ways of Hollywood to the Right. There’s a lot of suspicion of the creative community among the wingnuts, including the notion that conservatives are uniformly “blacklisted” in Hollywood, and while that may be true in some cases, it’s not necessarily a Tinseltown-wide conspiracy. Are most people in Hollywood left-liberal? Yes. But given a choice between the lefties in academe and the liberals in Hollywood, give me L.A. every time. They’re some of the smartest and most accomplished people I know, and they’re a lot better looking. OPEZ: Why didn’t you just play it straight from the beginning? You’re Michael Walsh. You’ve worked in Hollywood. You know how liberals think. Why not have Michael Walsh tell us? Funny interview … read it all. Is it just me, or does it seem that more and more, day by day, this title should be applied to the Constitution? Luntz: We’re gunna have one hell of an election I promise you that …. 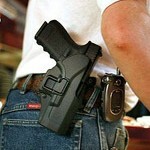 N.J. Democrat: How about $500 per year to exercise 2nd Amendment rights?